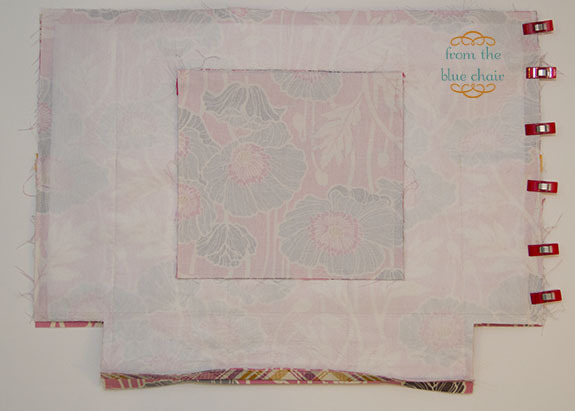 Attach fusible interfacing to both lining pieces as per product directions. 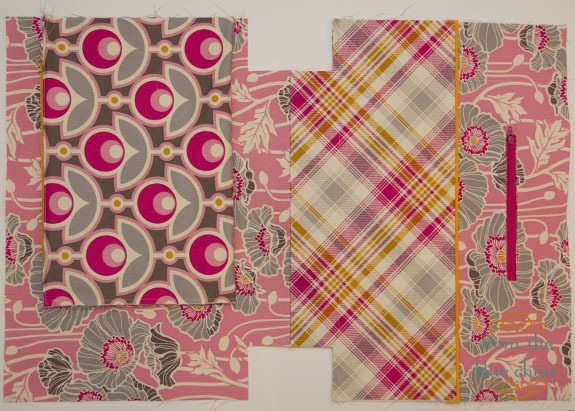 Cut 2 1/2" squares from bottom corners of lining pieces and pocket panel. Follow same process as for exterior pocket panels. 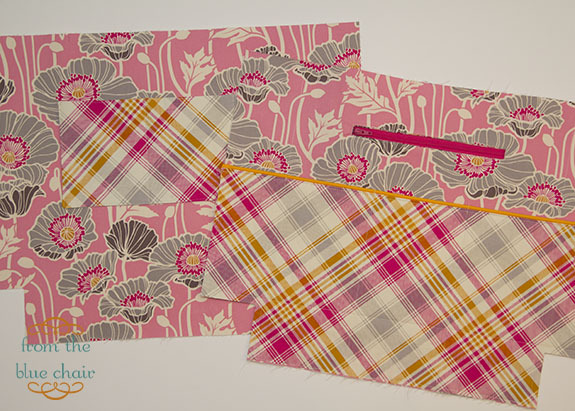 Aline pocket panel with lining piece and pin. Stitch vertical seams as follows (remember to stitch from the bottom up): 3/4" from left edge, 2 3/4" from left edge, 3/4" from right edge, 2 3/4" from right edge. Stitch additional divisions in the pocket as desired, but only stitch from bottom to the top of the pocket. Reinforce well at the top of pocket. 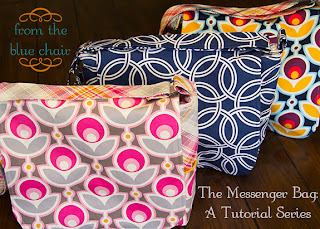 Head over once again to The Busy Bean and check out her tutorial for a welt pocket with exposed zipper. Follow her directions for this step. We'll be using the same measurements as her tutorial. Install zipper pocket in lining piece with pocket panel attached. Fold 10" square in half, right sides together. Stitch 1/4" seam around edges, leaving 2.5" opening in bottom for turning. Clip corners close to seams. Turn right side out. Push out corners with chopstick. Turn in unfinished seams. Press flat. Center finished pocket on lining piece. Top of pocket should be 3" from top of lining. 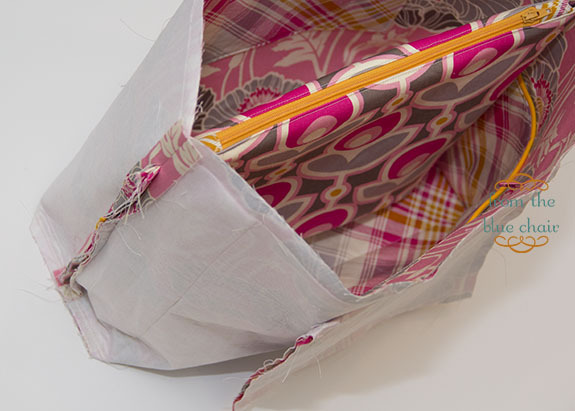 Stitch around sides and base of pocket, sealing opening at base of pocket. Mark and stitch additional pocket divisions as desired. Reinforce well at top of pocket. Arrange lining pieces right sides together. 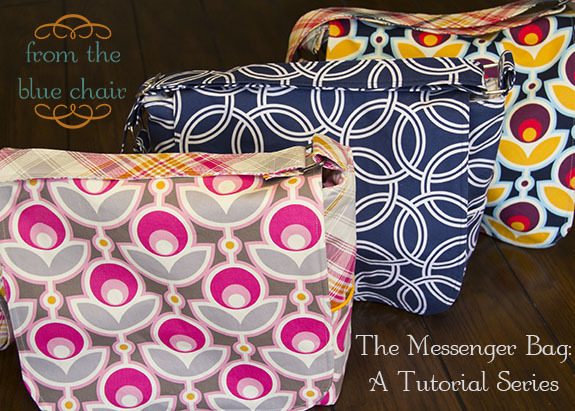 Sew along the bottom only with 1/2" seam allowance. Leave a 6" opening in center of base for turning bag. Press seam open. 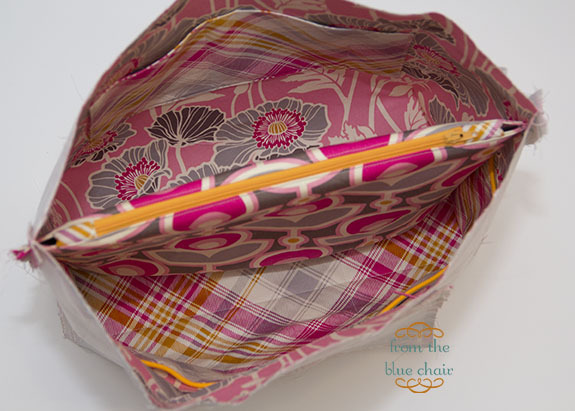 Open lining and arrange one side of the zipper pouch along one side of the lining. It should be 1/2" above the open rectangle for boxed bottom. Fold other lining piece on top and pin well. Stitch only this side with 1/2" seam allowance. Press seams open as much as possible. Repeat with other side. Bag will bunch up. Pin well to keep from slipping while sewing final side. Press. Box bottom corners as shown with the exterior portion of the bag. This is awesome, thanks again!